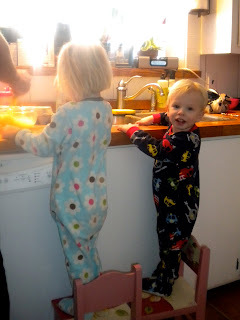 At about 7:30 this morning, I heard the sweetest little voice say "Mom-may. I neeeeed you." A few minutes later we heard "Dad-day. I neeeeed you." He went back and forth between mommy and daddy for about 15 minutes until we got up. Tucker never fussed or cried, just continued with the "I neeeeed you." I went in his room and got him out of his crib and told him Happy Birthday and then started to sing Happy Birthday. Tucker quickly said "No Mommy. No sing it." Why won't my kids let me sing Happy Birthday to them?!?! 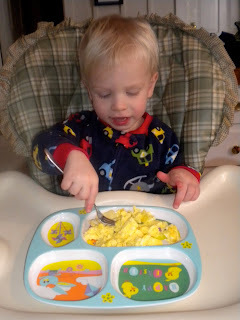 Tucker and Caroline made breakfast with Daddy and then Tucker opened presents. 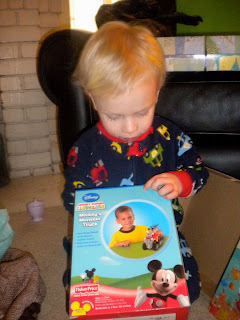 We gave him a truck movie, a set of plates with trucks, planes, trains, etc. on them, a truck book and a set of puzzles with trucks, trains, buses and boats. He was in heaven. He snuggled with Mommy on the couch and we watched the truck movie. This was a very exciting Saturday morning for one special birthday boy. 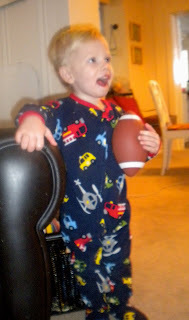 His next favorite thing was the new football. He did not put it down and even insisted that he take it with him when we went out to run errands today. All four of us went to Winchester and had lunch at the Mexican restaurant and then on to a few more places. Caroline wanted to get him a balloon. She picked out a very bright and colorful Happy Birthday balloon and a blue star balloon. They were both pretty excited with the balloons! After a short nap we went over to school to do some sledding. It was 17 degrees so we did not stay long. We each made a couple trips down the hill and that was enough. Tucker kept saying "I cold Mommy" and of course Miss Drama wasn't just cold but "freezing!" I do not have any pictures of Tucker eating the cake because that hasn't happened yet. After sledding we went to our friends house for dinner and forgot the cake. And, I wasn't about to give him the cake with tons of icing when we got home just before bedtime. However, he did have a taste of the cake earlier this morning. He would sneak into the kitchen, pull up a chair and swipe the side of the cake to get some icing. Shortly after that, he got brave enough to take off a wheel (oreo) and eat that. He was so kind as to bring one for his sister. I think he just did this so if he got in trouble, then she would too...such a smart little boy! So, we will do the fire truck cake tomorrow and take pictures then. Happy Birthday Tucker! It looks like you had a great day!